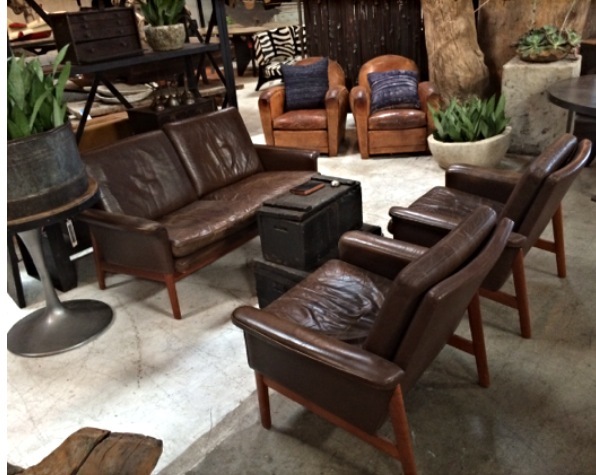 Recently a friend gave me a couple of things for helping her pick out some new furniture pieces for her house. 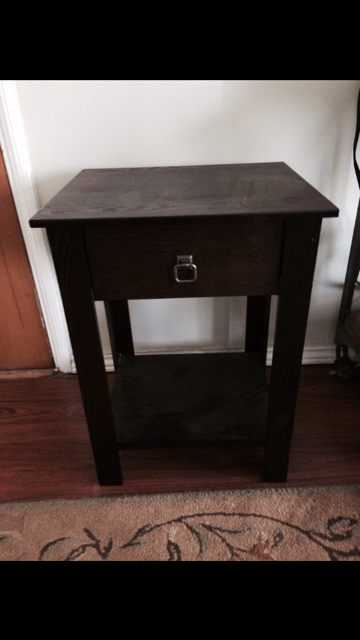 Among them was this side table. It was in awful condition– it was super scratched up and had even been stored outside for awhile. 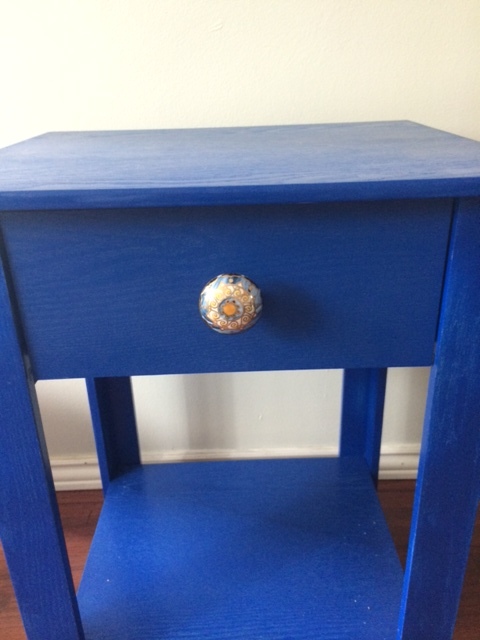 Not necessarily the shape or style I would normally choose, I decided to jazz it up with a bright electric blue paint and a fun knob from Anthropologie. The first knob I tried didn’t quite work. The second knob was much better! Here’s the finished product. Pretty fun, huh? I could totally see this jazzing up a room! I’m saying this cost about $10 because the knob was $7 and I didn’t even use half a can of paint or primer. 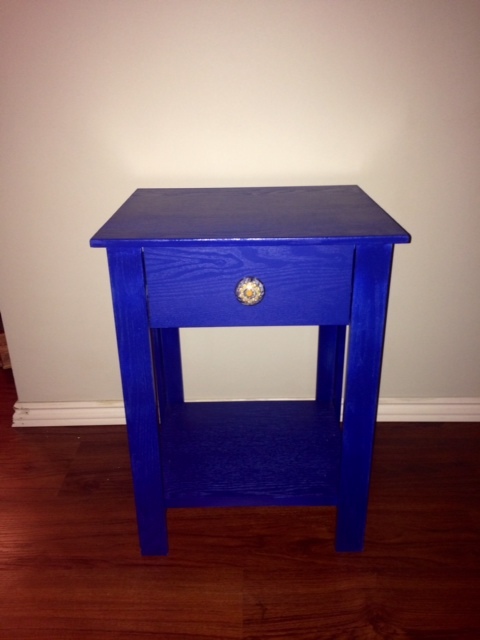 It was a totally simple fix, so before you throw away that piece that’s been bugging you, try painting it and giving it a new life! It isn’t just for Easter Eggs or salad dressing. I’ve heard about mixing up vinegar and water to clean mirrors and windows. I grew up using a vinegar soak to keep new bikinis bright. Recently, I learned that there’s a whole community online talking about the ways you can use vinegar and other natural ingredients in household cleaning. I guess I have hard water because my sinks have gotten this gunk from limescale that won’t come off with regular cleaners. I was googling what to do about it, and I came across vinegar. Articles said to soak a cloth in vinegar and let it sit on the spots for a few hours. On some sinks, I had more luck than others. In the bathroom, I poured the vinegar on, scrubbed a little with an old toothbrush, and then poured a little more on and let it sit for about half an hour before the white stuff just scrubbed right off. It felt like a miracle! Look how clean it got! The kitchen was a different story. I probably should have tested a small spot first, because the vinegar wasn’t working so well. One site suggested putting a ziplock over the vinegar soaked cloth, so I tried that and left it on for a few hours. 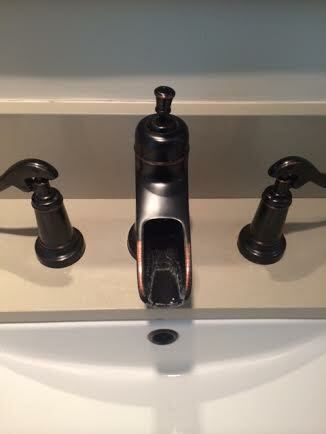 It ATE AWAY at the finish and seemed to corrode part of the faucet. Yes, the green limescale came off of the sink, but so did some of the finish. 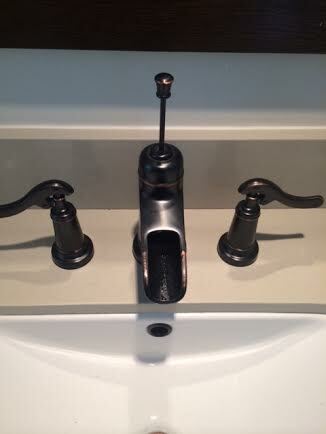 My boyfriend came over and was excited because he thinks the sink looks a lot better, but I’m voting for a new fixture. Anyway, I would say that the best thing to do is to scrub with the vinegar and to leave it on for only a little while. I wouldn’t do the whole vinegar soaked cloth thing again. It seemed like a lot more work, and not really worth the risk of corroding the sink. Chatting with the man behind the brand. 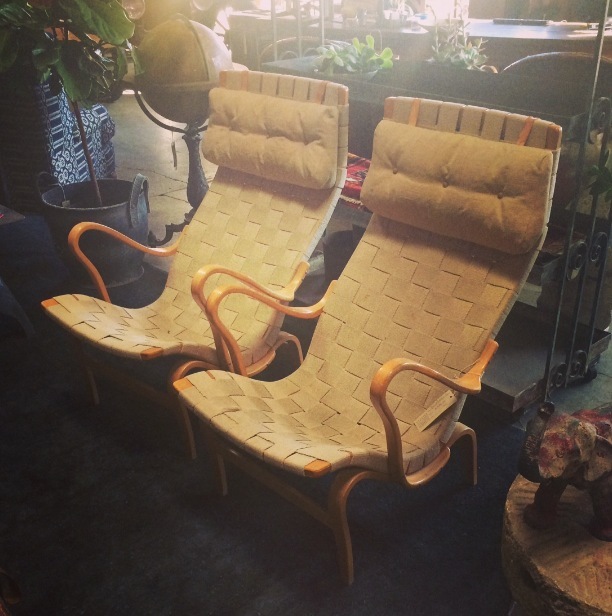 I’ve loved BD’s for quite some time, I love to go to their massive store off Jefferson and just get lost. 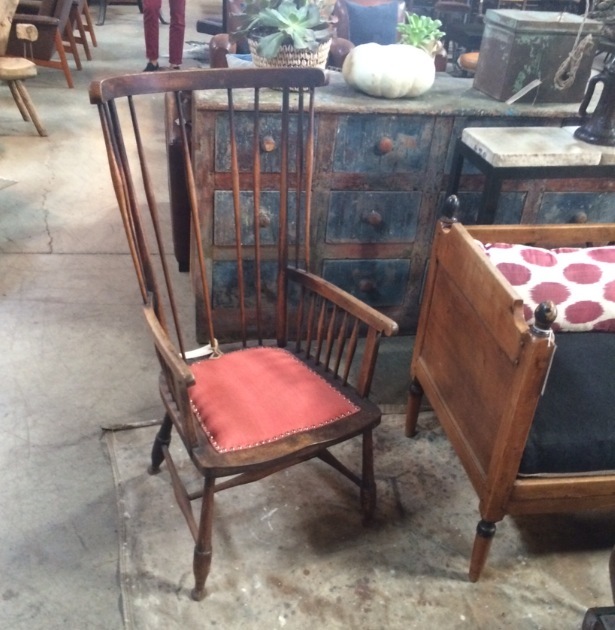 They always have creative, fun, and funky pieces (antiques and custom made!) that will take your rooms up a notch and make your space special. 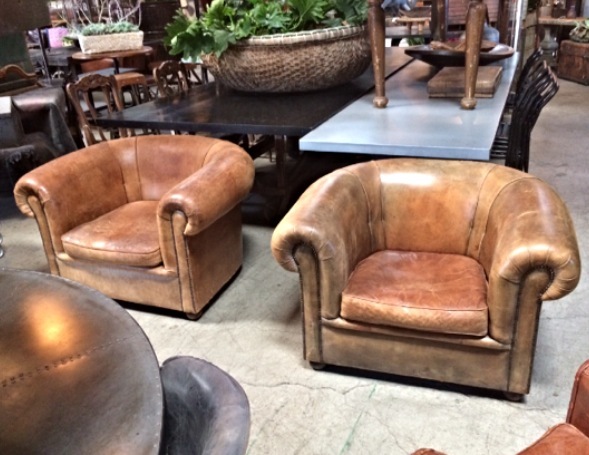 In the store, we started talking, and Shane told me about how he got interested in buying and selling furniture, and I knew I had to interview him. We talked about the business and how he got started, the find that got away, and he even gave me some tips for negotiating prices! RR: What’s your biggest source of inspiration? Shane: Walking in here. There’s nothing more inspiring than moving stuff around and combining different things and having it sell in the next day or 20 minutes even. I also look at a lot of magazines for inspiration. It’s interesting because (Big Daddy’s) hits every outlet. My creative outlet, my business outlet, and I think that’s why I still have a lot of passion for it. Other than that, the business is really fun and every day is different– I can go to the San Francisco store. I can go buying in the south of France or somewhere else. Its just fun! RR: How did you get started? Shane: I decorated a girlfriend’s house, and when it ended, I was selling off the pieces, and the buyers were telling me I had a great eye. I guess that’s why I’m still in business—I have a good eye. When I first started, I was schlepping stuff to the Rose Bowl at 4 AM in a $800 van I bought from my uncle. I’d be praying that it would make it to Rose Bowl so I could make money to feed myself and buy more stuff. So chic and so comfortable. RR: What do you look for in a piece? Shane: Patina and character. What’s going on at the time influences it. How I’m feeling, what people are buying. It evolves constantly. I’m not buying the same kind of stuff I was buying 20 years ago. Thank God! Also, I think what I look for has evolved with the amount of money I can spend. I had a good eye in the beginning, but I didn’t always have the money to back my eye. My eye is ALWAYS better than my pocketbook. RR: How has your style evolved? RR: A lot of rehabbers dream of having shops. 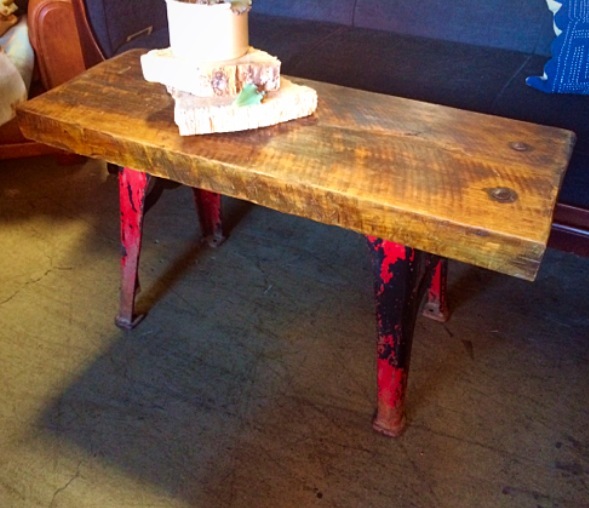 How did you go from buying and selling pieces to having a brick and mortar establishment? Shane: People couldn’t always come to markets, or they would call me and want to see stuff during the week. I heard that enough, so I finally opened here in LA. I was doing markets up in San Francisco, and I started hearing that enough. I would set up my area like a store, and people would ask where the store was, and I had some people come down to LA to see the store, and I realized it was time to open a store in San Francisco. A peak inside the a portion of the GIANT LA store. Shane: When I was first getting started, I bought some paintings for $5 each, they sold for $1300 each. 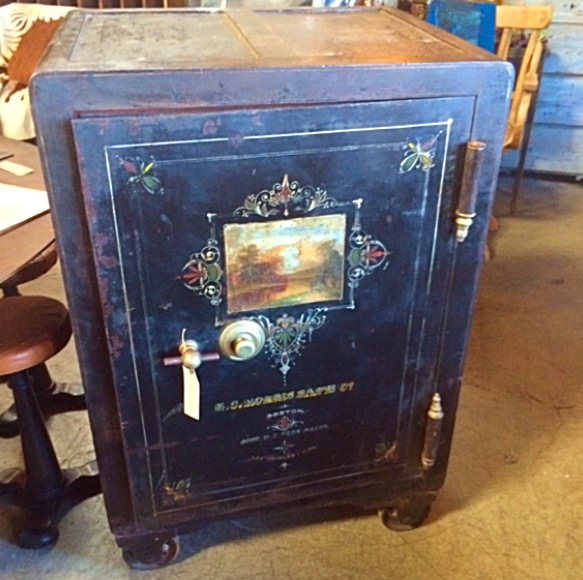 I bought a Louis Vuitton trunk for $600. I still own that, and it is now probably worth $15,000. RR: Has there been a “find that got away”? Shane: A sterling silver trophy. The price was fine, he just wasn’t negotiating with me. Someone else bought it about twelve steps later. When I was younger, there were a lot of things I had to let go because I just didn’t have the cash to buy them. Now, I usually just buy something if I think its great! RR: Where do you find this amazing stuff? Shane: People text me photos all day. I have two containers coming in that I bought off photos. Also, I find a lot of stuff in Europe. I do major buying trips about 6 times a year. 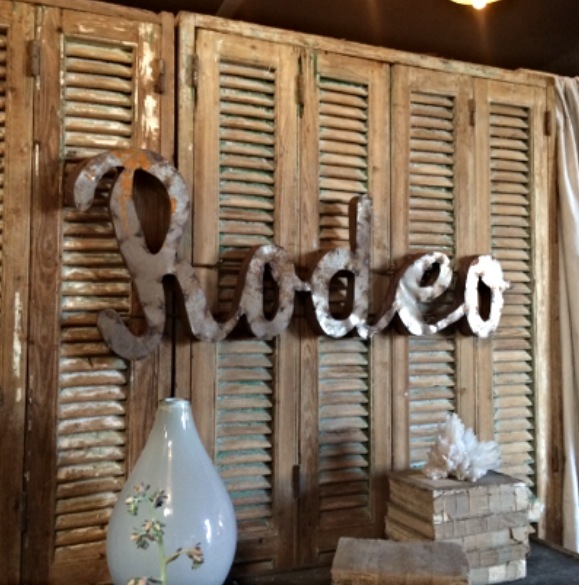 This sign has character, a thing to look for when buying pieces for your spaces! RR: What’s the best part of the job? Shane: I meet the most interesting people. You meet the whole spectrum of society. I might meet a broke artist making really cool things, or a billionaire collecting odd and interesting things. Like yesterday, I wasn’t planning on going downtown, but I went and met this amazing artist from Portugal who is doing all of these murals on the sides of buildings that are crazy and a client of ours took me down there. I’ve flown on a customer’s private plane to go install a rock from Bali. 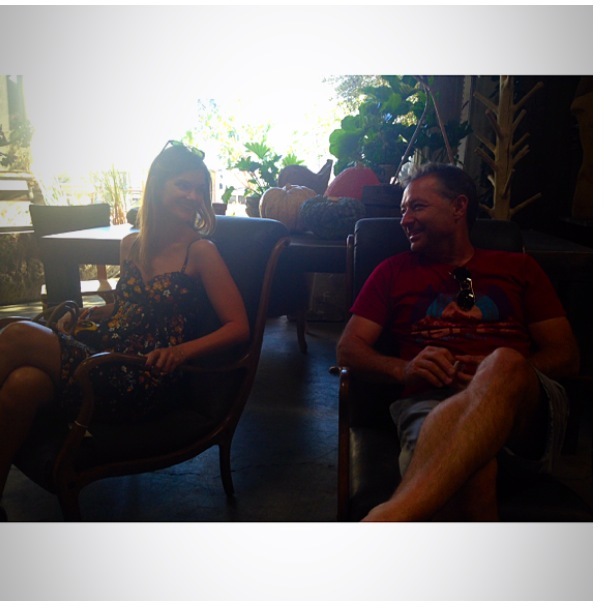 That’s the best thing—meeting really interesting people. Also, I’m living exactly the dream I created in my head as a child. I mean, to the wife, to the kids, to the business, to multiple homes… everything I wanted as a kid. I didn’t know what I wanted to do, but I knew that I wanted to travel, have a healthy family, and I wanted to have a fun, interesting lifestyle. And, I think I’ve done it! RR: Have you had any “what was I thinking” moments? Shane: I’ve been married for a long time now, so I don’t really have any of those! RR: What are your design pet peeves? Shane: Dead plants, plants in cheap container or the black plastic container. If you’re sitting in a multi-million dollar home and have really cheap pottery because you’re too cheap to buy nice pottery, it really irks me. Also, lamps without lampshades drive me crazy. This bench is pure perfection. They had several in store while I was there, and they were on their way out the door. RR: Do you have any negotiating tips? Shane: We’ve become a throw away society. They aren’t as interested in quality because they don’t expect it to last. People used to pay $20,000 to decorate their living room and expect it to last 30 years. Now people just buy mid-priced things and expect to throw them away. I’m trying to teach my little girls that is not all about looks, it is about what’s on the inside that counts. An example of a quality piece. My note: This also applies to quality furniture. 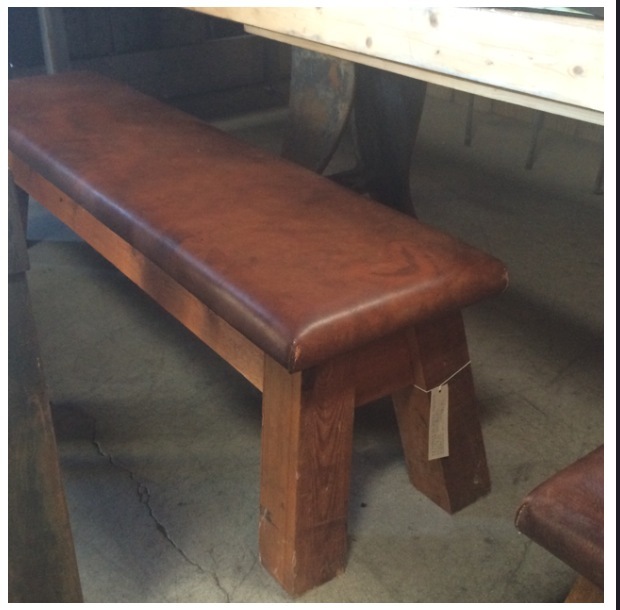 It’s about finding the good bones and quality pieces that will last. This is the kind of stuff Shane is attracted to and sells in the store. Another note: We had a wonderful long interview. In some instances, word order has been modified for flow. I loved talking to Shane and learning about how Big Daddy’s became what it is today. It was so much fun to hear his stories and learn about the business. After more than 20 years, he is still passionate and excited about the work that he does. Talk about a dream job! 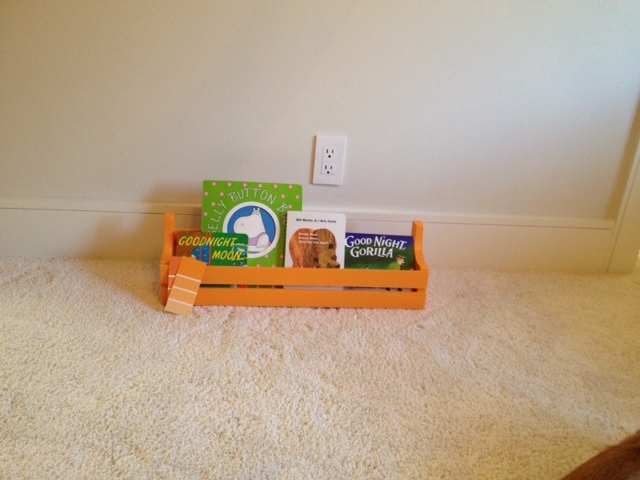 Today is all about bright baby shelves I helped a girlfriend paint for her new baby’s room. 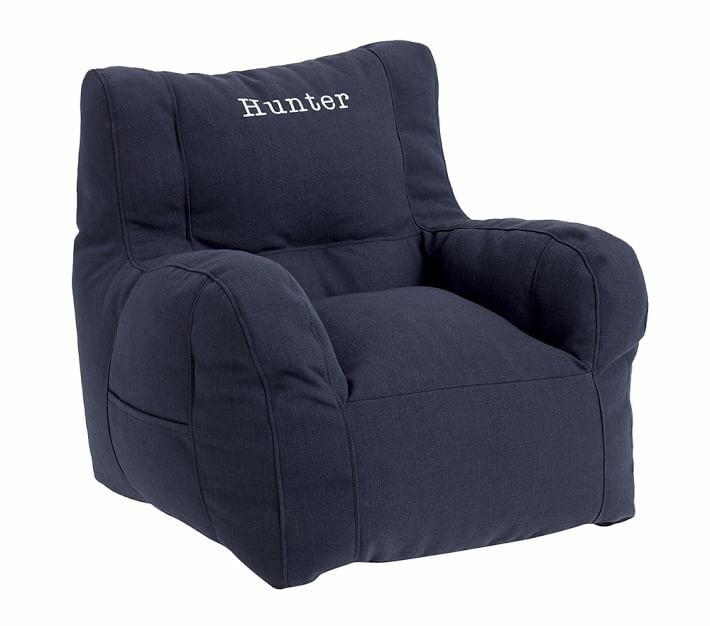 She wanted to add a touch of color and to create a reading space for when the baby gets a little bigger, so we started out with a cute denim “Bean” chair from Pottery Barn Kids and some plain wood shelves. 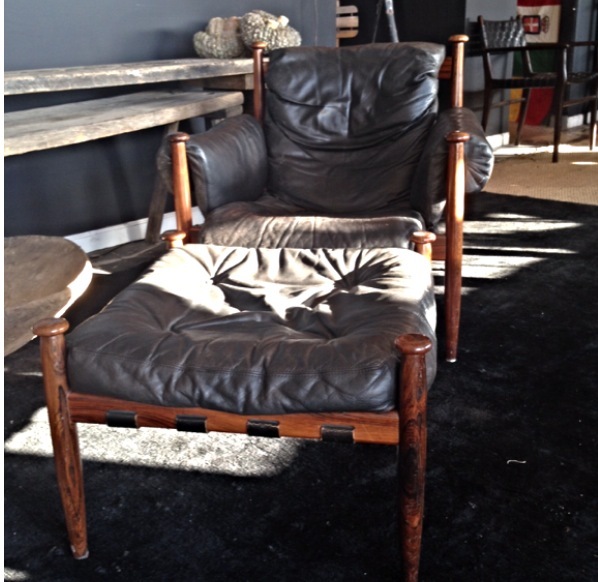 Here’s an image of the bean chair I grabbed off of PB’s site. Cozy and cute! 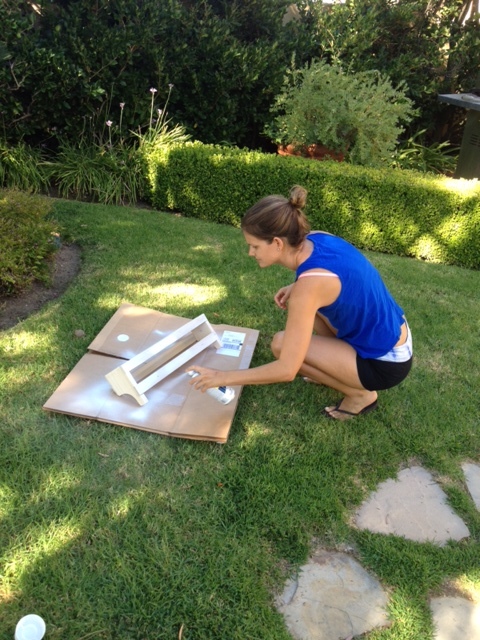 Kate (the mommy-to-be) bought some unfinished shelves online, and it was up to us to make them shine. Me priming in her yard. After a couple of coats, we left them outside to dry. 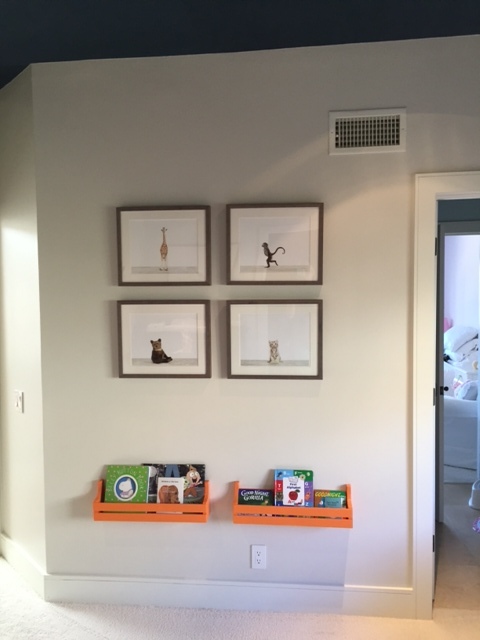 A few days later, she painted them a bright orange that we chose and had mixed. She painted them with a brush. After a couple of texts back and forth on technique, I think I should tell you guys that the best advice I have for painting with a brush is light strokes with less paint than you think you need so you don’t get those streaky brush marks. Streaky brush marks are the equivalent to paint drips. In other words, avoid at all costs. 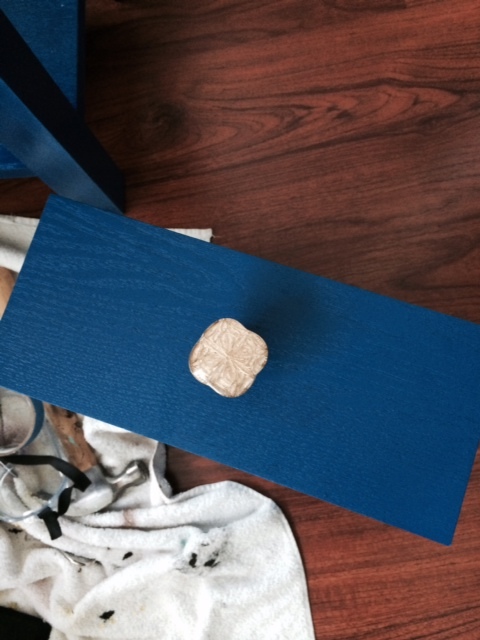 But if you do get streaky brush marks or paint drips (we all do sometimes), I to sand them down a bit with a fine grain sandpaper, run a tack cloth over the piece, then get back to painting! Okay, so here are the finished shelves installed. Cute, right?! 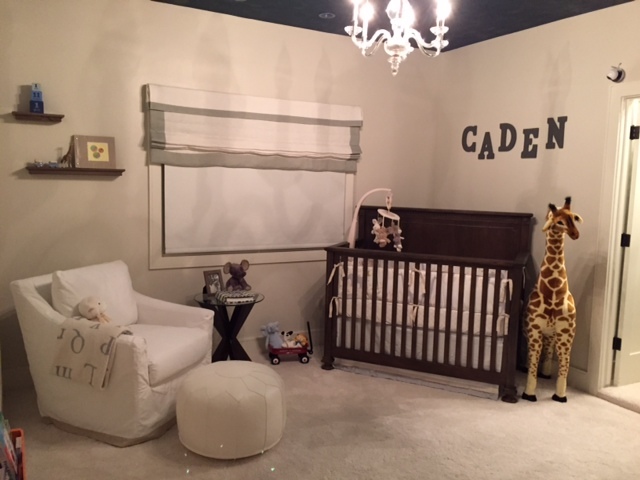 And, just for fun, here is another corner of baby Caden’s bedroom. I love the animal theme! Okay, so I didn’t quite finish over the weekend (it was super busy and this little thing called “school” keeps getting in the way…) but I finally finished my wreath project last night. After trimming up a bunch of succulents, I had to leave them for a few days to callus. 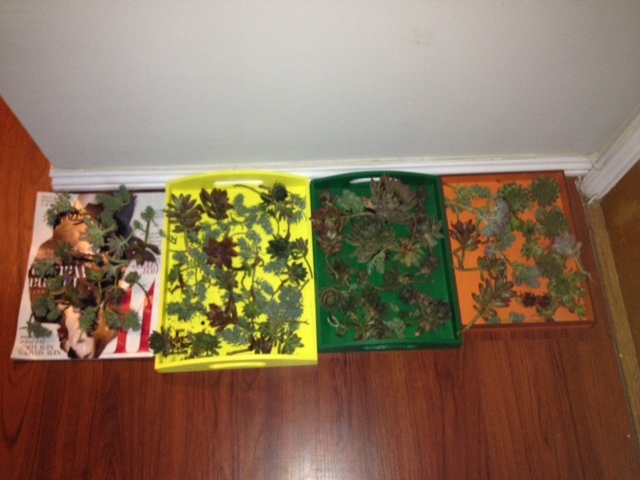 Some of my tray projects came in handy here… and an old W magazine! I got so busy and had to wait a couple more days than I would have liked, but they didn’t look too bad once I started assembling the wreath. 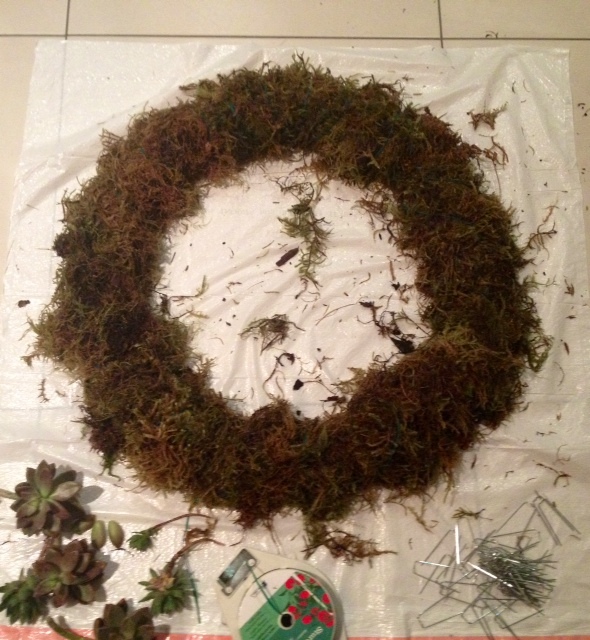 Putting the moss on the wreath form: big mess! I made a huge mess putting the moss on the form. You’re supposed to soak the moss, squeeze it out, then tie it to the form. I used this wire tie stuff they recommended at the hardware store. Oh, and online it says to wear gloves when working with moss, FYI. Apparently you can get a fungus that gives you lesions. Yuck. Anyway, I decided to opt in on the glove wearing. Not bad, huh? It is sitting on a trash bag for now because I’m attempting to protect the floor. It looks a little wild, but that’s okay with me– I’m a little bit messy myself. Here’s the thing– you are supposed to let it lay flat for a while so that the succulents can take root. You mean you can’t hang it right away!?! That’s right, you’ve gotta let it sit. I think I may put a bunch of candles in the middle and use it as a pretty table topper til it is ready to hang. All in all, I am pretty pleased with the results. I would post a link to a tutorial, but I kind of combined a bunch of methods because it seemed like pretty much every tutorial wasn’t detailed enough and I had to do a lot of outside searching about different aspects of the project (how to trim succulents, for example). 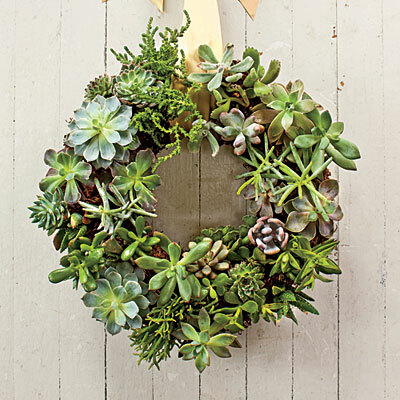 If all goes well, my plants will grow in and the wreath will look fuller like this one. The tutorials said to space the plants out for growth. How much did it cost? It ended up being $45 for all of the succulents, and I could have made two small wreaths or one large. I opted for a large. The wreath form was $3, the floral pins were $2. The moss and the tie stuff cost $17. (I had gloves and trash bags :-)) I had to go to three different places (and to the Valley, which if you’re from LA, you know that’s a major pain) to get all of the materials. And it was a whole lot of work. So, in total, I paid $67 for the wreath (not including labor). Would I do it again? It was a fun project, I like that I got to pick my own plants and lay out all of the colors. I don’t like that I have to wait to hang it. I really didn’t like cutting up the succulents– you had to get your hands in the dirt, and the first time I touched a snail, I almost freaked. There were spiders, rollie pollies, and worms in my plants. They were grown outside- that is normal, I get it. Bugs aren’t my thing. There’s nothing like the satisfaction of being creative and making something from nothing, but for $35 more, I could have a ready to hang wreath with no work. I love what I have now, and I’m glad I did it, but I probably wouldn’t take on this project again. I was toying with the idea of making friends wreaths as a surprise for the holidays, but that idea has been thrown out the window. If you want to take it on, I suggest ordering a pre-made wreath online. You can get it for as cheap as the form, moss, and ties combined (if not cheaper) and it will save you a lot of time and mess. Stumbled across this baby on the Southern Living site and can’t wait to make one for myself. 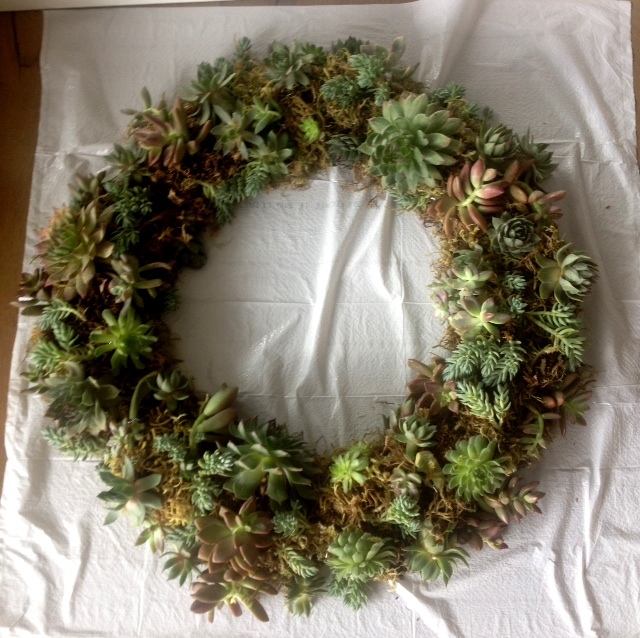 The best part about succulent wreaths is that they’re living, so you don’t have to replace them all the time! They sell at Williams Sonoma and Pottery Barn for upwards of $100, but in true rehabber fashion, I think this is more of a DIY endeavor. How low do you think I can go? November 13, 2013 by Alli CoxLeave a Comment on Makeover Made Cheap! I am SO TIRED of my living room. It is really, really pretty. I have a beautiful sage green couch that you just sink into, a gorgeous hand me down paisley goldish-colored chair. I have a green and gold rug with gorgeous vine designs with accents of burgundy and the tiniest bit of blue peeking out. To accent that blue, I’ve anchored a gorgeous baby blue vintage kitchen door onto my main wall. The walls are a pretty dove gray (it took 3 different colors to get there). Yes, the details are there, but they’ve also been there pretty much since I moved in three years ago… and it is dark! These colors are gorg but I wanna switch it up for that bright, airy, LA vibe. Hey, we’re so close to the beach, why not?! You’d think that’d be an easy thing for a rehabber to fix, right? Well, I guess this little thing called time keeps getting in my way. Oh, yeah, and his friend money. Think I can do it? 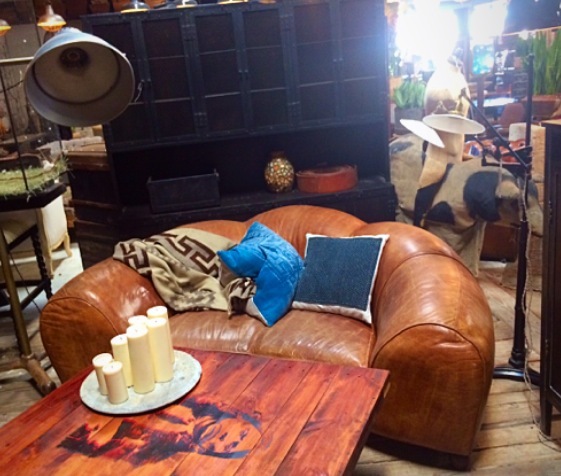 Is $500 reasonable for a total living room makeover? Do you have any tips?